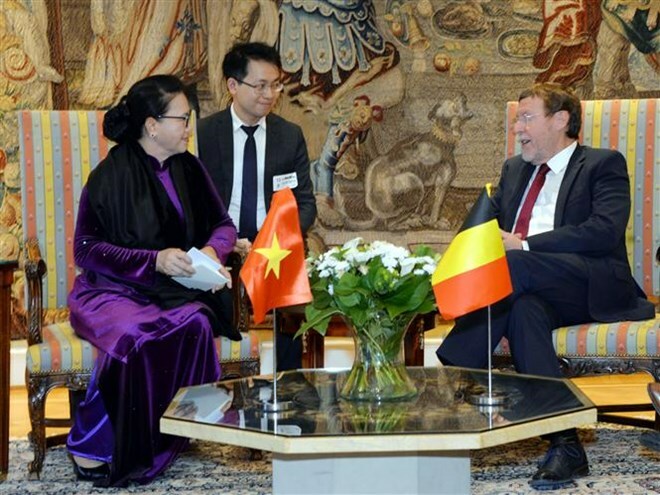 Brussels (VNA) – National Assembly Chairwoman Nguyen Thi Kim Ngan met President of the Chamber of Representatives of Belgium Siegfried Bracke in the capital city of Brussels on April 3 after arriving there. President Bracke said it is time to sign cooperation agreements in diverse areas, especially in agriculture. He suggested that both countries should work closely together in education, particularly at the tertiary level, adding that creativity is crucial to achieving a win-win cooperation. NA Chairwoman Ngan, for her part, said ties between Belgium and Vietnam are growing in a wide range of areas, adding her visit aims to push the development of bilateral ties in a more practical way. She also expressed her hope that both sides would consider a new cooperation agreement in the near future. Informing her host of Vietnam’s current situations, Ngan said the country grew 7.08 percent last year. The country has integrated more deeply into the world economy with its participation in 12 free trade agreements (FTAs), she noted, adding that Vietnam is about to sign and ratify another four FTAs. Ngan said many foreign investors select Vietnam as their investment destination for its favourable business climate, stable socio-economic environment, and good economic growth. The top legislator stressed Vietnam highly values its cooperation with Belgium and considers the country an important partner in Europe. Recently, the two nations have recorded successful cooperation in various areas, with bilateral trade hitting 2.8 billion USD last year. Vietnam is striving to intensify collaboration with Belgium in all fields, particularly in renewable energies like solar and wind power, Ngan said. The country also wants to step up bilateral ties in sea port infrastructure, public health, agriculture, and education and training. Currently, Belgium offers 40 scholarships to Vietnam on an annual basis, and supports the country via a host of educational projects and cooperation programmes with Vietnamese universities and research institutes. At the meeting, the leaders also discussed the EU-Vietnam Free Trade Agreement. Ngan showed her hope that the Belgian Federal Parliament will raise it voice to foster the European Parliament (EP)’s ratification of the agreement, as the ratification will bring about practical benefits to Vietnam, Belgium and the EU. Acknowledging Ngan’s proposals, Bracke said that both sides realised the importance of the EVFTA in economic development of all parties. He added that involved parties will consider the completion of all procedures to ratify the agreement at the beginning of the next tenure of the EP.